This edition is limited to only 440 in the world! Thomas Kinkade paintings featuring the great outdoors are among his most popular paintings. occasionally available on the secondary market. 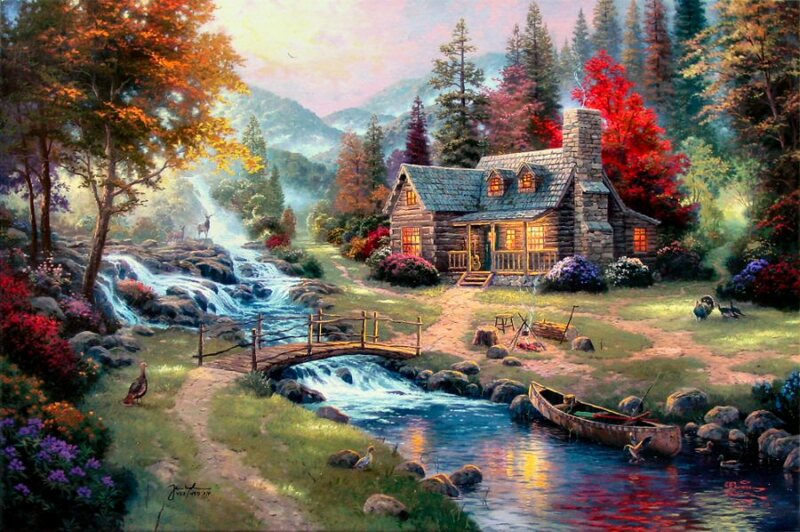 Thomas Kinkade Thom painted Mountain Paradise as a daydream of the idyllic mountain hideaway. 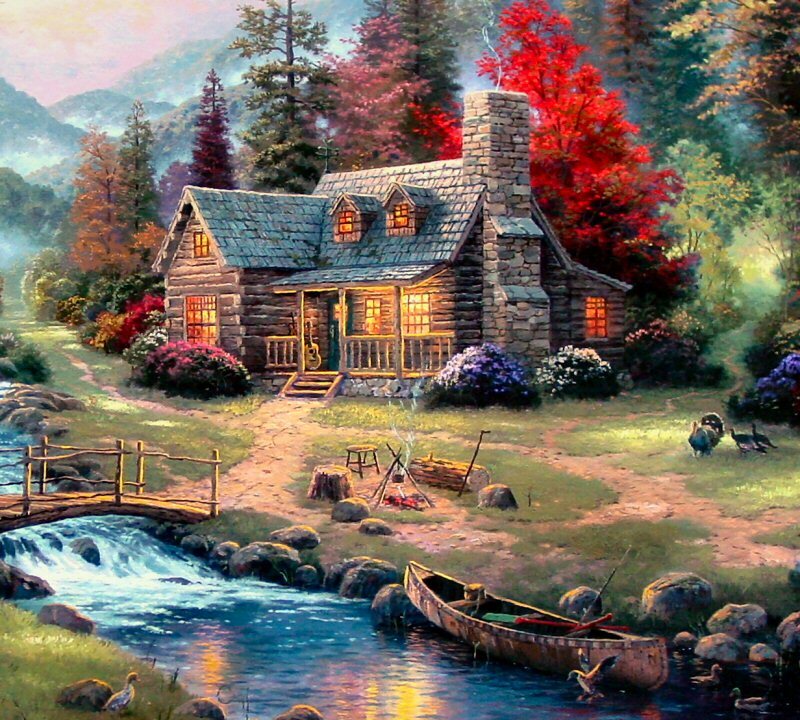 Mountain Paradise is the second of two paintings in Thomas Kinkade's Mountain Retreats series. The other painting in the Mountain Retreats Collection is Mountain Retreat, painted by Thom in 2005. Mountain Paradise features 12 hidden N's in tribute to his wife, Nanette. ++++ Rare! This Edition is Limited to only 440 in the world! ++++ Printed on Heavy Grade Anti-acid Archival Paper that will last for generations! "It is possible to embrace the world of our deepest dreams. I do that as an artist, and it is my fervent hope that canvases like my new Mountain Paradise enable you to do that as well. My Mountain Paradise is set in one of God’s heroic mountain landscapes — I have found that I cannot dream anything grander than the glories He has created. 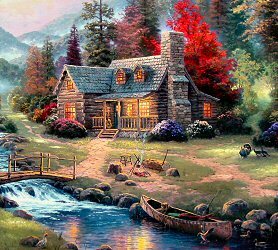 Here is a rustic cabin nestled into a truly idyllic hideaway. 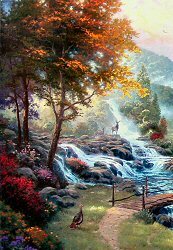 A mountain stream cascades over an array of ancient stones, creating myriad waterfalls that sing their praise of the Lord in the voices of water. Perhaps the strumming of bluegrass music might add to the chorus as evening lingers — isn’t that a guitar and fiddle resting in the shadows of the cabin porch? Access to my paradise is provided by an old wooden bridge. 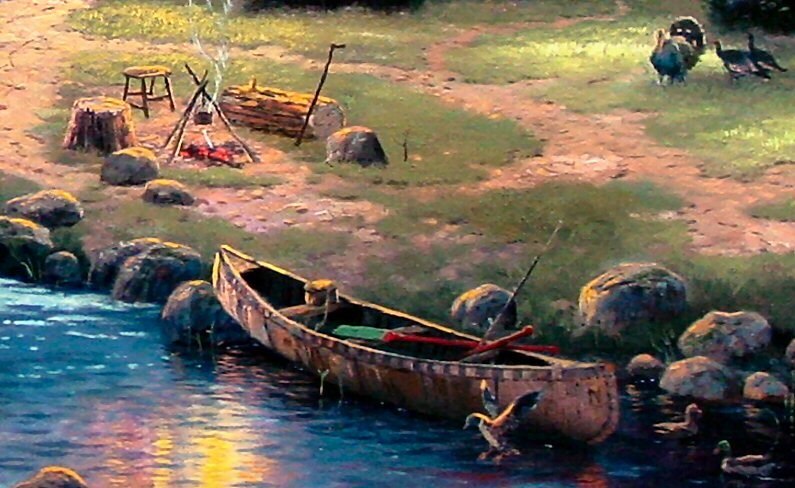 Intriguing trails and a waiting canoe entice the camper to explore the nearby hills by foot or water. A handsome stag and mate and a lively flock of wild turkeys attest to the abundance of wildlife; wild ducks drop in for a landing. The light of sunset pours from the sky, painting the clouds and nearby hills with a heavenly radiance. My Mountain Paradise is truly my daydream of an idyllic mountain hideaway."